The police and security forces patrolled the streets of the hills and kept a tight vigil at all the entry and exit routes. DARJEELING: Clashes between the police and Gorkhaland supporters today resulted in injuries to several persons on both sides at Jaigoan in Alipurduar district, bordering Bhutan. The Gorkha Janmukti Morcha (GJM) and the other hill parties took out a rally at Jaigaon on the 46th day of an indefinite strike called by the GJM in the hills. According to the police, clashes broke out between the securitymen and the Gorkhaland supporters after the participants in the rally, carrying kukris (Gorkha knives), hurled stones and petrol bombs at the police personnel. The police tried to convince the GJM supporters to refrain from attacking, but the agitators remained defiant and broke the first two barricades. They kept hurling stones at the police, who then resorted to using water cannons and firing tear gas shells, besides using batons to disperse the crowd. At this, the protesters turned violent and set a few vehicles, including those of the police, afire. Several police personnel and Gorkhaland supporters were injured in the clashes, the police said. The GJM claimed that the police resorted to indiscriminate firing. The police, however, denied the allegation. Similar processions were taken out at Kalchini. GJM supporters took out rallies at the Chowkbazar area of the hills, carrying black flags as a mark of protest against police action on Gorkhaland supporters. Shouting slogans against the West Bengal government, they demanded an immediate intervention by the Centre. 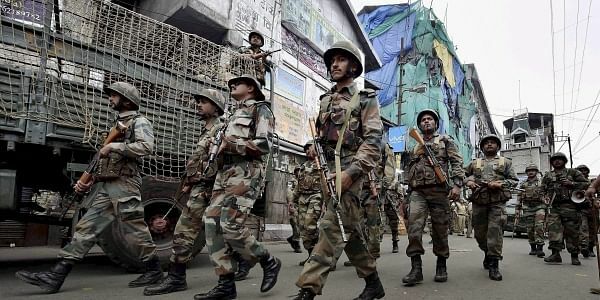 Gorkhaland supporters, armed with knives, swords and kukris, had tried to forcibly enter Siliguri yesterday, demanding that the town be included into the separate state of Gorkhaland. In the Naxalbari area of Darjeeling, the locals took out a rally against the GJM and their demand for Gorkhaland and set tyres on fire as a mark of protest against the ongoing agitation in the hills. In the Sukna area of the hills, which is close to Siliguri, the ruling Trinamool Congress (TMC) in the state took out an anti-GJM rally. The GJM and the other hill parties held an 'Anna Dan' (rice donation) rally during the day as a mark of protest against vehicles, carrying food supplies to the hills, being set ablaze in Siliguri. Each participant in the rally carried a handful of rice and other grains and donated it in a box, which will be handed over to the district administration and, in turn, will be sent to the West Bengal secretariat as a mark of protest. Barring the medicine shops, all other business establishments, restaurants, hotels, schools and colleges remained closed. The workers of the GJM and various NGOs of the hills were seen distributing food among the people as the food supply has been severely hit due to the ongoing shutdown.